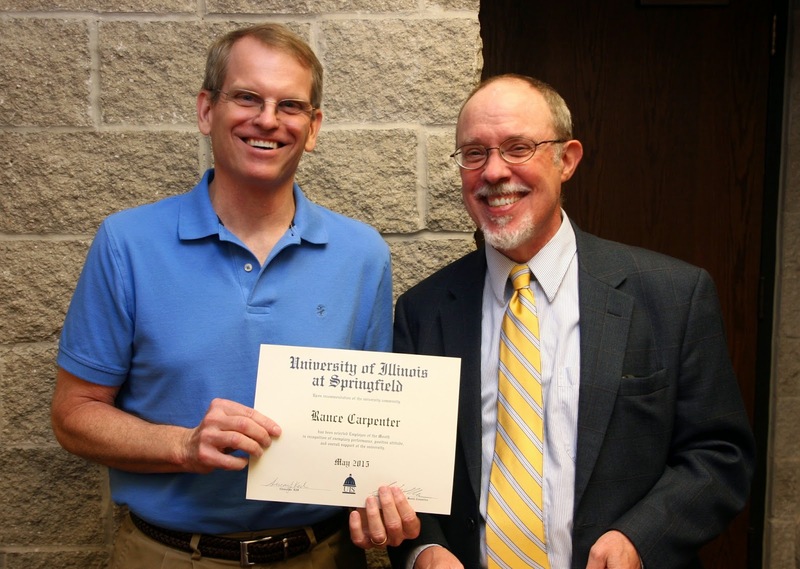 One must be doing something exceptional to be described as "awesome" by his co-workers, and that's precisely the word used by a colleague to describe Rance Carpenter, the director of the Graduate Public Service Internship program, and the University of Illinois Springfield Employee of the Month for May. Rance's nominator describes him as easy going yet very professional; someone who has formed good relationships with state agency supervisors that will keep the GPSI program thriving. His supervisor describes him as one of the good guys. Someone who treats everyone he works with--from interns to faculty--with respect and consideration. "He is always building rapport," his supervisor writes, "and his behavior has directly contributed to a widespread, favorable view of GPSI," and to the high regard his staff has of him. Rance's nominator believes he's an excellent example of Leadership lived at UIS, and though he sometimes believes he has to play Good Cop/Bad Cop with the university's interns, his nominator doesn't it see it that way. "He says he has to be Good Cop/Bad Cop sometimes with the GPSI interns, but we never really see him be bad cop because he sits down with the interns and has a one-on-on conversation, and in the end everyone is happy," writes his nominator.